Miao & WafuPafu Comic Blog » Miao’s First MC. « Thief in da House! I’m sick again and took my first MC on Wednesday. Being a productive cat, I don’t really like the feeling lying on the bed doing nothing at all. In the afternoon when I felt better, I actually went to the bank to settle some of my matters, went to the workshop to get my radio fix and of course went to the hospital to get a shot. Oyah I even went to my Japanese Class at night. Being productive is not a good thing after all. Posted on April 24, 2009 by Jian Akiraceo. This entry was posted in Rant and tagged first mc, my first mc, sick. Bookmark the permalink. i know, it’s sux to just lie on the bed doing nothing. i used to be like u, doing this and that while i hv the mc (doing lab reports, assignments) and not attending the class. but it got worsen, and nagged by my roomate instead. rest a lot, miao and get well soon!!! dont worry, cat got 9 life… XD sure every time miao is revived, miao will be more revitalized! wah Bro~ u are taking japanese course too?? you wan to expand ur career to Japan?? 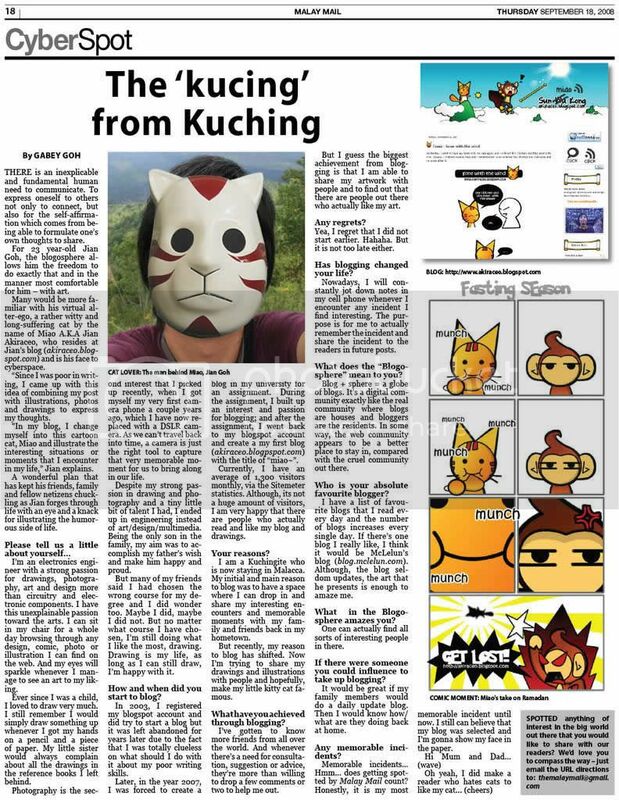 hehehe…not bad leh..mayb u can try..Japan oso famous with their cartoon..u can try it out! Their art are a different level with mine..
Haha, you came after me. I am now recovered. I don’t eat healthy and I’m not exercise much.. I think I need to go to gym starting tomorrow..
now I know why some of the doctor don’t give MC liao…becos those ppl like you lar, give MC still want to move around, wasted, don’t give. u cant just do ntg when u MC. but u can just enjoy sitting at home, watch ur own favourite movie…maratons! 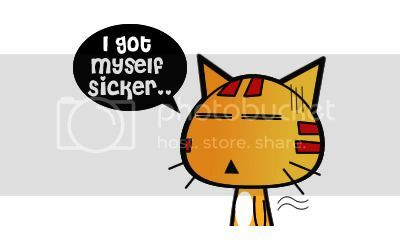 Now my ex-boss is coughing d.. she seems to be very vulnerable..
hahaha.. no la.. you must SWEAT it out.. just wrap urself up in blanket, sit in room, off fan, and just SWEAT. and drink lotsa water. But recently they two being such a lazy butts..
i love your blog. your cartoons are awesome! do you cartoons of dogs as well? I seldom do cartoons of dogs..
that is why u must make use of ur MC. GET some rest and get well soon! Pingback: Stupid Miao at Work « Miao & WafuPafu Comic Blog | Dong Dong Chiang!